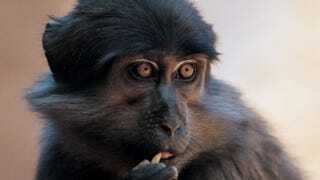 Sooty mangabeys are a monkey species found on the western coast of central Africa. Their unique immunity to SIV, a relative of HIV, has intrigued medical researchers for decades. Now we know just how their immunity works. SIV and HIV function in much the same way - the viruses find two molecules on the surface of the cell, which are known as co-receptors. These molecules function much like gates. One of these molecules is CD4, which is found on immune cells known as T cells. The immune response triggered by the appearance of the virus stimulates these T cells, which boost the level of the other co-receptor, CCR5, which in turn facilitates the deadly infection. But sooty mangabeys are able to avoid that chain of events, thanks to a unique type of T cell called a central memory T cell. When this particular type of T cell responds to the virus, it does so without activating CCR5. This helps the T cells survive the SIV infection, and it's a crucial reason why these monkeys are able to avoid the onset of AIDS. Best of all, central memory T cells are long-lived in the body, and their positioning in the lymph nodes makes them particularly effective in stopping the spread of SIV. "Not all T cells are created equal. Some appear to be more important than others for keeping the immune system up and running. This is why having central memory T cells resistant to infection is so valuable. By protecting central memory T cells, sooty mangabeys avoid the loss of T cells and the chronic immune activation that are the hallmarks of AIDS in humans. For several years, we and others thought lack of chronic immune activation was the main factor protecting sooty mangabeys from AIDS. This study changes this working model and proposes that lack of immune activation in sooty mangabey is secondary, deriving from their ability to protect and maintain their central memory T cells." These sooty mangabeys might well offer a new way to help cope humans cope with HIV infection and avoid AIDS. The key will be better understanding the mechanisms of their central memory T cells and figuring out how they avoid activating CCR5, which is the main reason why their immune systems are able to survive these infections essentially intact. Via Nature Medicine. Image via.